Calling all College Soccer players! 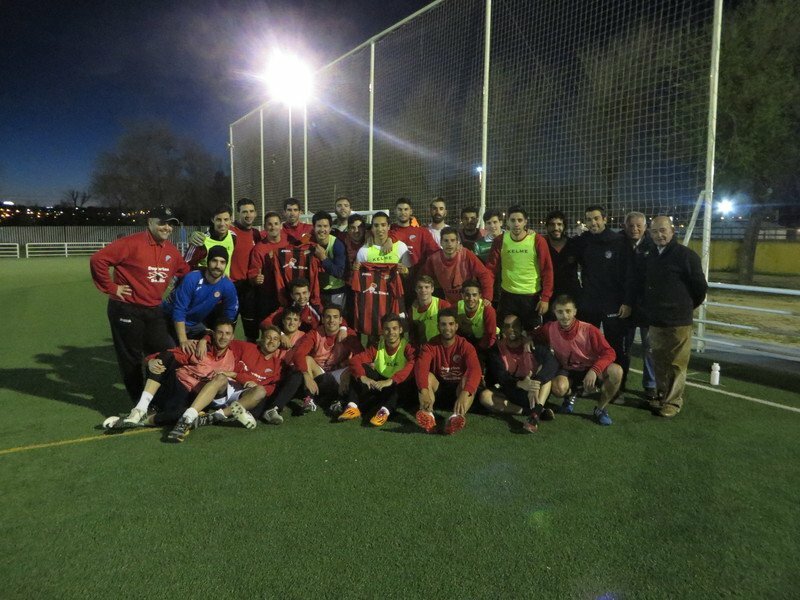 Come to Sevilla for a Spring semester to study the Spanish language and culture whilst also playing competitive soccer! At SAIIE, we have cooperated with three well-renowned local soccer clubs Triana CF, Azahar CF and Calavera CF to offer an academic-athletic program where competitive College soccer players have the opportunity to study with us and train with the team whilst still earning college credits. With the Soccer program, students must choose a minimum of 12 credits from our range of academic courses. We offer courses in Spanish language, Spanish culture, Liberal Arts and Business among other areas of study. 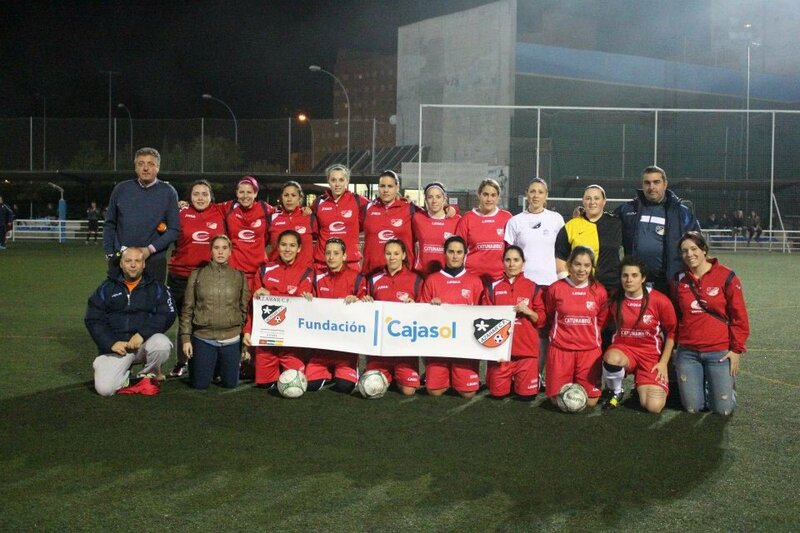 Alongside their studies, they are also placed in a local football team with one of the following Sevillian soccer clubs: Triana CF, Azahar CF or Calavera CF. 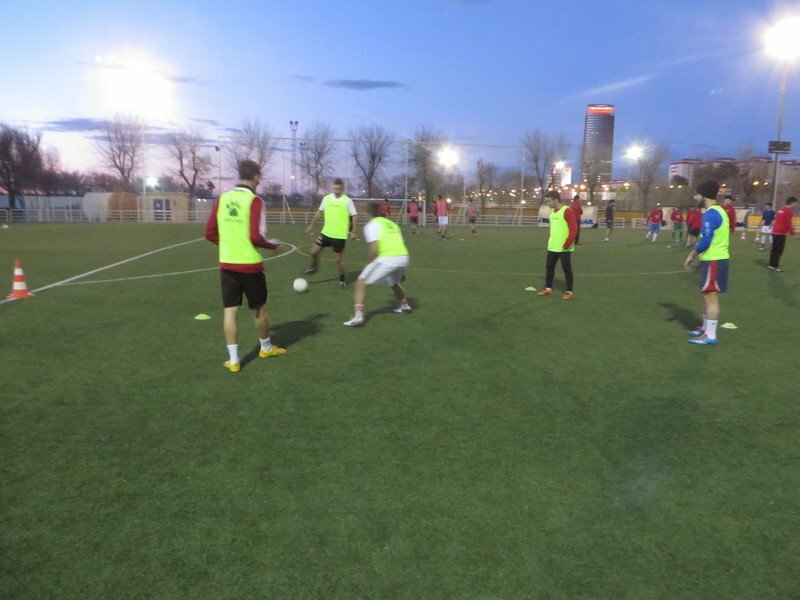 Students participate in 3 weekly training sessions and various friendly matches throughout the term. Why play soccer in Spain? Soccer is the number one sport in Spain. Considered to have some of the best soccer clubs in the world, such as Real Madrid FC and Barcelona FC and the 2008 and 2012 Euro champions, Spain is the ideal setting to practice and improve your soccer skills. 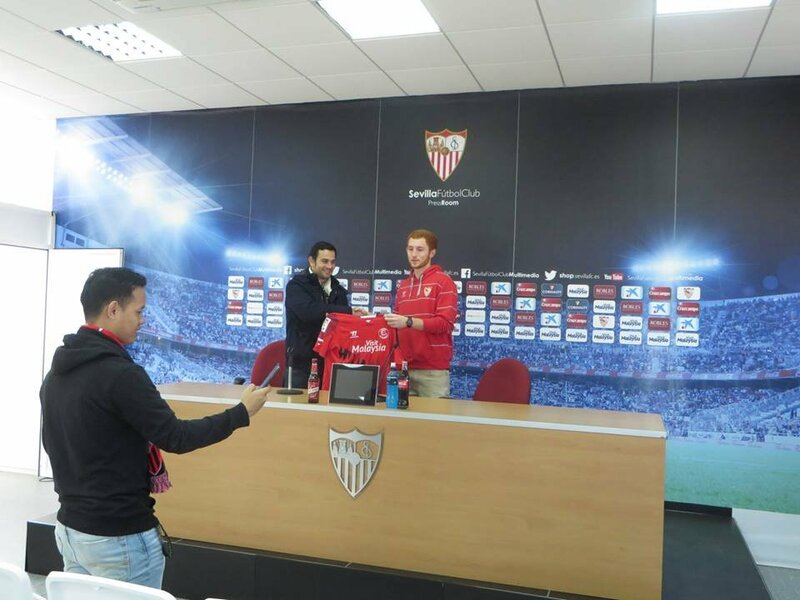 Seville is also well-represented by two major soccer clubs: Sevilla Futbol Club and Real Betis Balompie, both of which compete in the Spanish soccer league, “La Liga”. Our study abroad and soccer program gives soccer players the chance to expand their academic experience at the same time as allowing them to continue their development on the soccer pitch - a great option for those concerned about sacrificing the important spring season. Also, by playing on a Spanish team students will be able to practice Spanish on a weekly basis with Spanish natives and make friends. Student-athletes will also learn another style of training and playing methods and get to play against other Spanish teams to see their level. 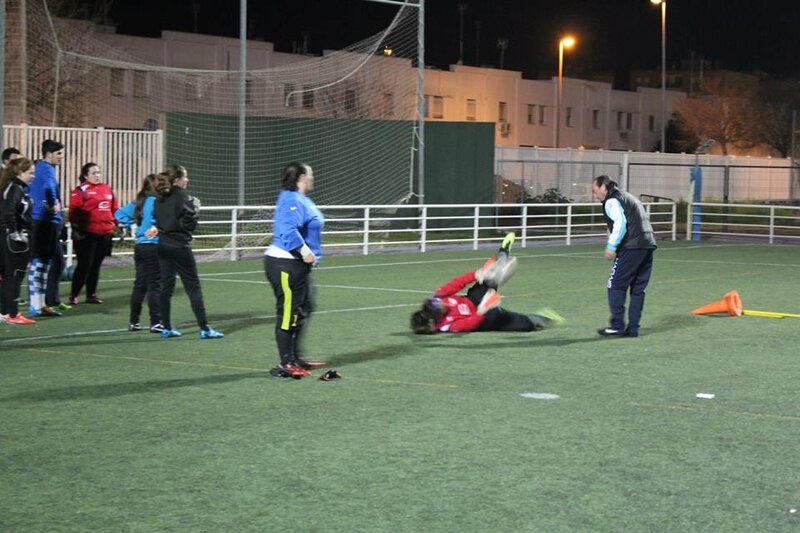 3 weekly training sessions with a Spanish local semi-professional team. Students must be playing soccer on their varsity team back at their home university. If you do not see your question listed here please contact us . The fields you will be training on are made of artificial turf. What type of soccer shoes do I need? You will need soccer shoes suitable for artificial turf grounds. Trainings will last for 1-2 hours. You will train for 11-12 weeks in total. Yes. You will be training with Spaniards on a Spanish team with Spanish coaches. This is an important aspect of the cultural immersion part of the program; through the soccer program you will be surrounded in a constant Spanish speaking environment and this will give you a great opportunity to improve your Spanish. There will be a maximum of 4 American players per team. The players are between 18 and 25 years old. Will I be able to go see an official professional soccer match? Yes, we will organize to go watch a professional "La Liga" soccer match in the spring term. Am I, as a college student, breaking any NCAA soccer rules or regulations by participating on this soccer program? No, you are not. 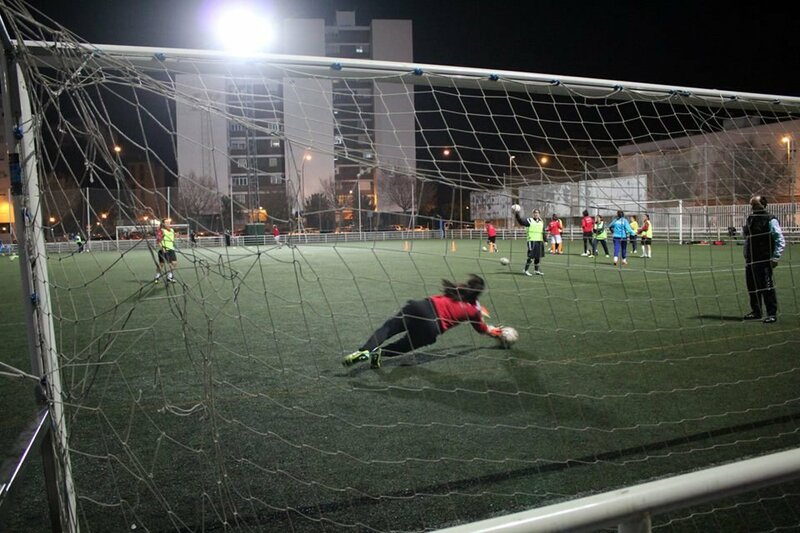 You will only be training with a local Semi-pro Spanish club and playing in friendly matches. These soccer clubs you will play with do not pay their players to compete. "Futbol here is something that cannot be compared to soccer back in the states." I would like to start out my blog with the centerpiece of my trip. Soccer. Futbol here is something that cannot be compared to soccer back in the states. The passion for the sport is something that originates within the veins of very young boys and girls. Wyatt and I are currently members of a semi-professional team called Triana C.F. The competition here is extreme, and the practices alone are making Wyatt and I much better soccer players. I love that fact that although most of these men have full time jobs, they still sacrifice time and effort to come together and be such a brotherly team. I can’t wait to see where else this takes me. This experience is something I will never forget, and I hope others can experience the same joy that I have. "My technical skills improved greatly and same with my Spanish skills." My technical skills improved greatly and same with my Spanish skills. There is no weak link in the team, all very technical, tactical and fit, its like they know where all their teammates are on the field all the time. 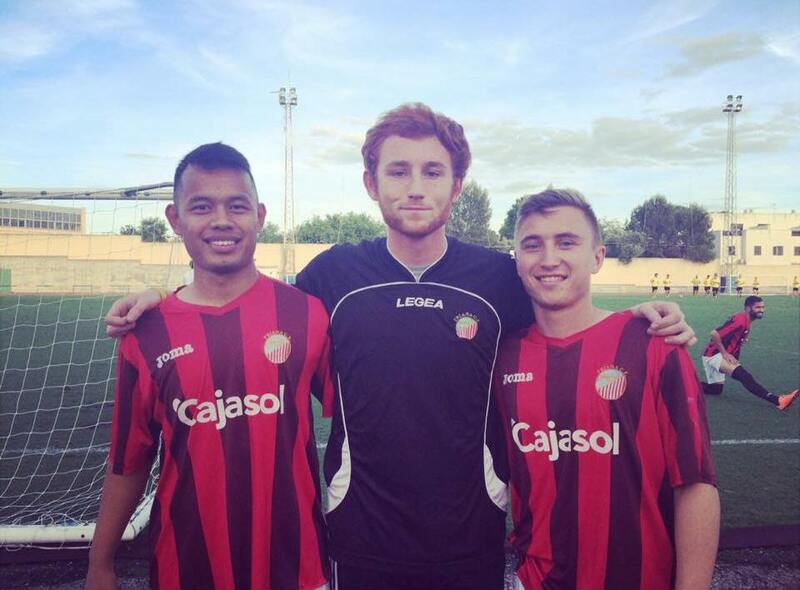 Check out what Wyatt has to say in his blog about his soccer experience in Spain with us! "The level that this team played at was beyond anywhere I had played in my life." The experience that SAIIE gave me was life changing in its fullest meaning. In addition to the wonderful staff, SAIIE gave me the opportunity to play the sport I love. (...) My biggest concern was that the level would not allow me to grow, and prepare myself for my upcoming school season. When I arrived at my first practice with local semi-pro team Triana C.F., I immediately realized I made the right decision. The level that this team played at was beyond anywhere I had played in my life. "I highly recommend the soccer program with SAIIE." "I’d say my soccer experience in Spain was a great experience." 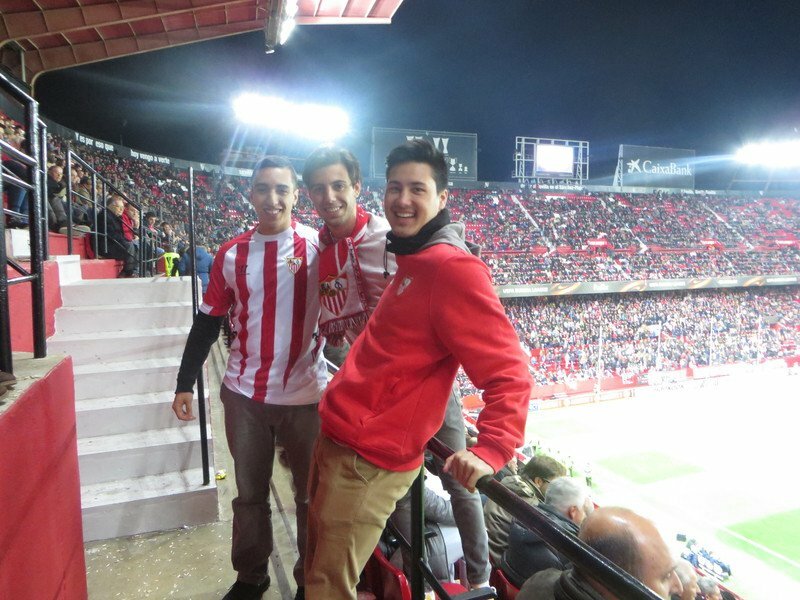 "Thanks to the SAIIE Study Abroad & Soccer Program I was able to achieve my dream!" 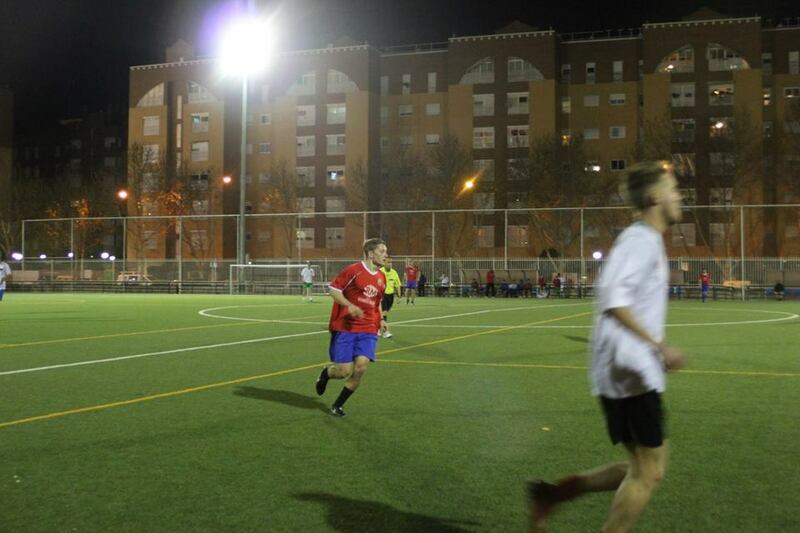 My soccer experience in Spain through SAIIE was one of the highlights of my overall experience! One of my dreams was always to go abroad to study but I always felt that would not be possible, because that would mean missing out on an important part of my soccer season. Thanks to the SAIIE Study Abroad & Soccer Program I was able to achieve my dream! I loved the practice sessions, the training methods, my coaches and specially getting to meet all my Spanish teammates who were very welcoming and nice. Not only did I manage to keep my level of fitness while abroad but I also got to fully immerse myself into Spanish culture because all my practices were in Spanish and I was forced constantly to practice all the Spanish I was learning at the program. I am so grateful to the SAIIE program for giving me this once in a life time opportunity. "Playing soccer in Spain was a dream come true in my life." 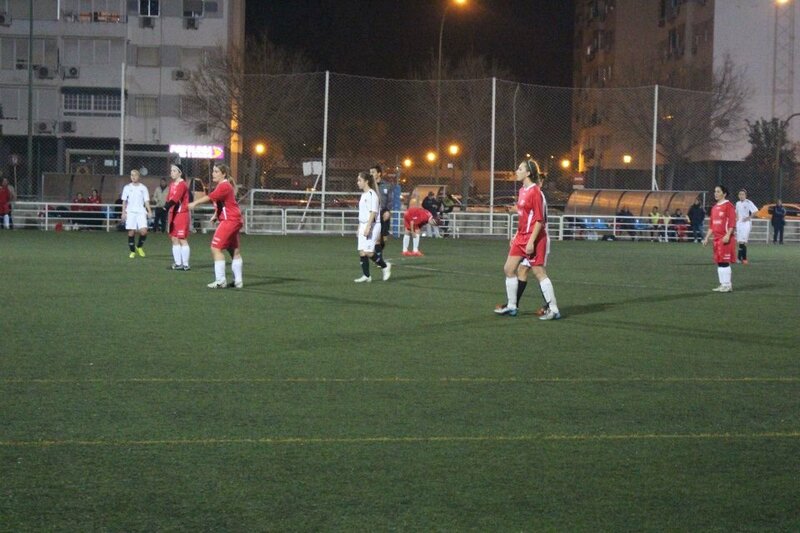 Playing soccer in Spain was a dream come true in my life. The opportunity that SAIIE gave me was once in a lifetime and it was something no soccer player should miss out on. I practiced with the team three times a week and played in two friendly games. I noticed right away the fast paced nature of the game, not necessarily the physical speed of the players, but the movement of the ball. Everyone's touch was perfect and challenging each other in practice was something I had to get used to right away. I made new friends while training with the team and was forced to speak the native language, which was a great experience for me to. I came in halfway through their season, but they were very respectful in letting me in and encouraging me throughout the rest of the semester. I'm grateful of the opportunity SAIIE gave me and will always remember that semester playing semi-pro soccer in Spain for the rest of my life. "It is moments like this that I will never forget from my time abroad. 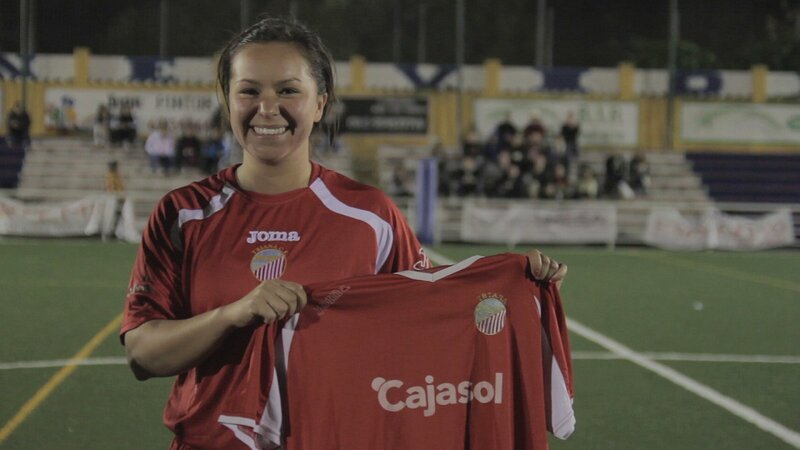 Un regalo para recordar el club, the President of the Triana Fútbol Club said as she handed me the jersey." It is moments like this that I will never forget from my time abroad. 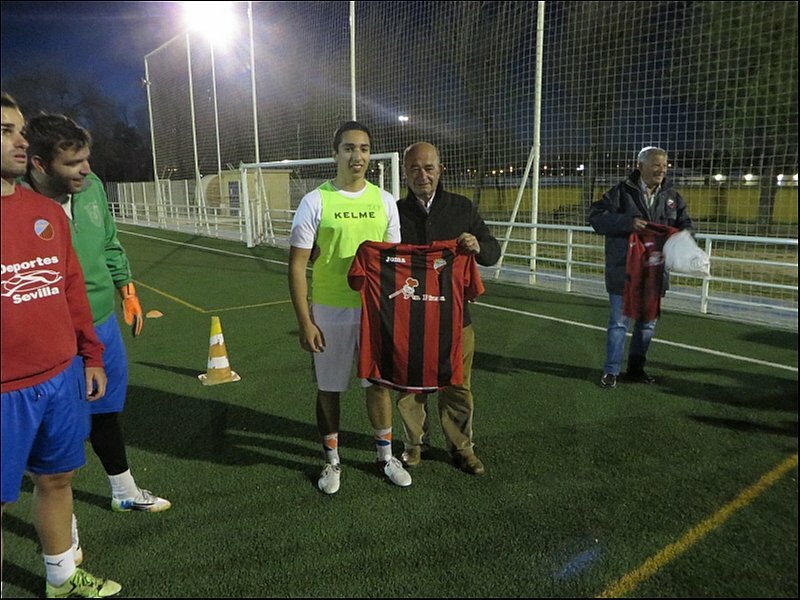 "Un regalo para recordar el club," the President of the Triana Fútbol Club said as she handed me the jersey. This photo was taken before my first friendly with the Triana F.C. During my time abroad I have had the opportunity to play with a local soccer team, and it has definitely been an experience. In the beginning, it was not easy being the only one on the team who was not from the country, let alone not fluent in spanish. It took time to get comfortable with those around me and even get use to the difference in the way soccer is played here. At times the experience was difficult but this experience has truly taken me out of my comfort zone and has taught me to embrace things that may seem foreign to me. I believe this opportunity truly gave me the ability to experience an entirely different world through the people and many different obstacles I faced. I have been so blessed to have been able to experience something like this and I will never forget it. This unexpected act of kindness by the club president and all those involved will forever be remembered. The experience, as a whole, will never be forgotten and I am so thankful for this experience. She was right when she gave me this jersey, with this jersey and these memories I will never forget the Triana Fútbol Club. "While the cultural and educational experience offered to all students at SAIIE is fantastic, those students who choose to particpate in the soccer program will experience an even more intense immersion while playing the game at a new level that few get to experience." 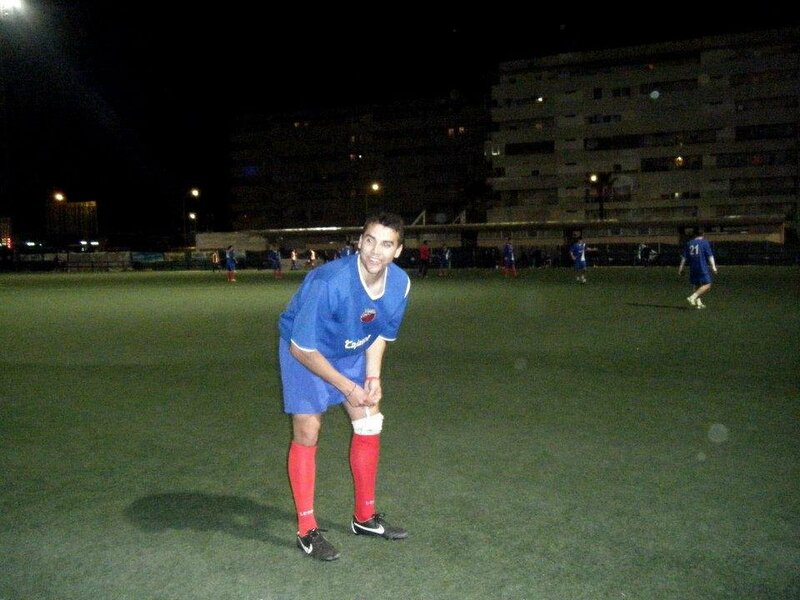 Playing soccer in Spain as part of the SAIIE program was a unique opportunity to play the sport I love at a level I had never played at before. Admittedly I was a little intimated to go to the first practice with Triana FC. Indeed, I found out very quickly that playing Spanish soccer was going to be a huge challenge as their speed and style of play differed greatly from America's. In comparison to our style of play which is often characterized by long balls, brute force, and vast amounts of running, the Spanish style of pass and move, letting the ball do the work, seemed elegant and simplistic. The more challenges I found in my way, the more I saw myself develop as not only a soccer player but as a foreigner experiencing a new culture. My Spanish teammates helped me learn to play the game faster and sharper, analyzing the field in a new way so as to be able to keep movement of the ball quick and uninterrupted. Trying to process what they were saying to me in the adrenaline-fueled environment of a practice or friendly game also greatly improved my linguistic skills. In addition, as I developed camaraderie with my teammates, our off-the-field chats enhanced my cultural knowledge of their country and society. 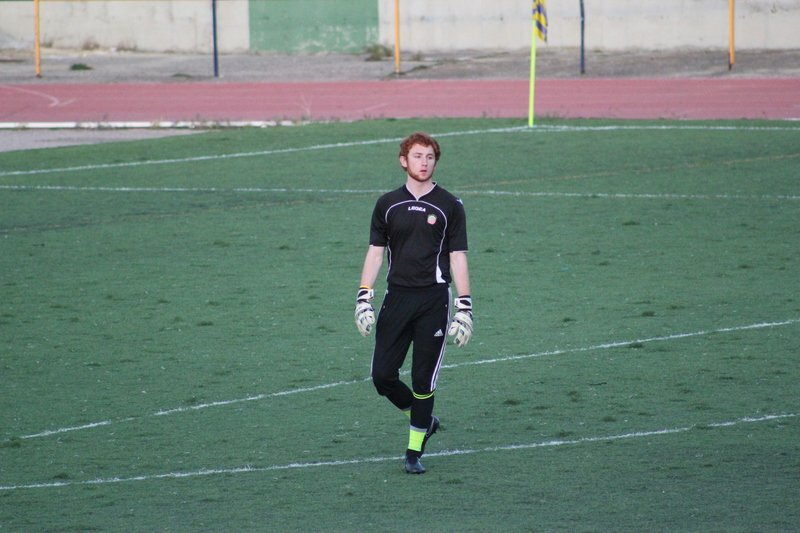 All in all, my experience with Triana FC was one that greatly helped my skills and confidence as a person and player. While the cultural and educational experience offered to all students at SAIIE is fantastic, those students who choose to particpate in the soccer program will experience an even more intense immersion while playing the game at a new level that few get to experience. "The possession and speed of play was great." The girls were very friendly and helped us understand drills at practice. Also playing in friendly games was great and seeing a different style of play. The possession and speed of play was great. Basically everything! I enjoyed the experience and level – better than home. I enjoyed everything! I enjoyed the experience and level – better than home. "Playing soccer in Spain was a unique experience!" I enjoyed the ability to keep playing soccer in my off season and having the opportunity to meet Spaniards and learn about the Spanish soccer philosophy.